On Saturday afternoon, 196 nations approved the Paris Climate Agreement, a landmark global deal that aims to lower greenhouse emissions and curtail the increasing effects of climate change. French Foreign Minister Laurent Fabius, who presided over the delegation, called the agreement "a balance which is powerful yet delicate," and a "historic turning point" for the world. Major world leaders, including French President Francois Hollande and President Barack Obama, celebrated the sweeping agreement when news broke that it had been endorsed by nearly every country in the world. 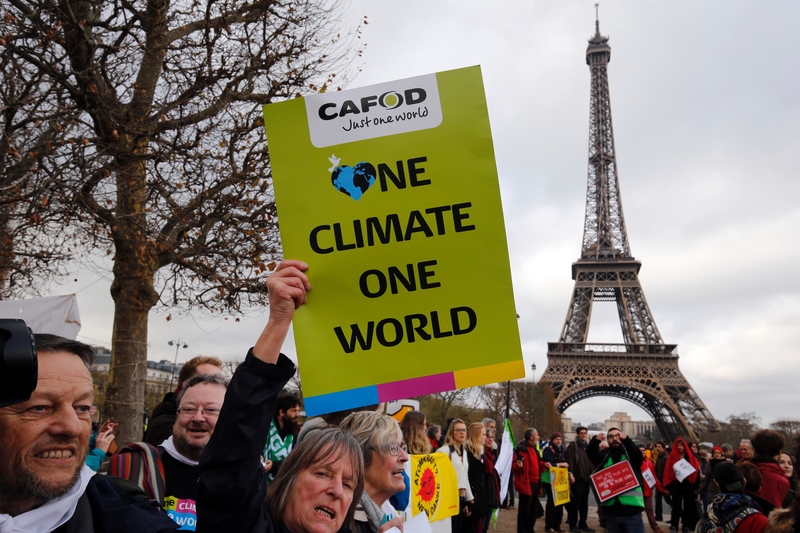 "The decisive agreement for the planet is here and now," Hollande told the delegation on Saturday, prior it the agreement's official approval. "France calls upon you to adopt the first universal agreement on climate." The sweeping agreement was also endorsed by the European Union and the G77. The agreement outlines several provisions on how to lower the Earth's increasing temperature, with the aim of keeping the increase to below 2 degrees Celsius of the pre-industrial temperature average. Each nation that approved of the agreement will also have to report back every five years to ensure that every country is doing its part. All countries will be required to cut their carbon emissions. "Looking out to the room I see that the reaction is positive, I see no objections," Fabius said prior to Saturday's announcement. "The Paris agreement is adopted. "When Fabius made the announcement, the delegation reportedly broke out into a standing ovation. Even videos from the press room show journalists jumping to their feet the moment the plan was approved. People gathered both outside the conference and near the Eiffel Tower in central Paris on Saturday to celebrate the landmark deal. Prior to the announcement of approval, protesters also took to the streets to advocate for the agreement. Bonus to saving the earth: A bunch of people in polar bear costumes. We'll take it. The mood near the Eiffel Tower seems ebullient. Images of the tower have also circulated with various points of the deal such as "1.5 Degrees," and "For The Planet" near the bottom of the lit up landmark. The delegates stand up and cheer as the vote to approve the Paris Agreement on Saturday. Back and forth added an additional day to the conference to iron out details. The entire document took weeks to come to a final solution that all 196 countries would agree to.